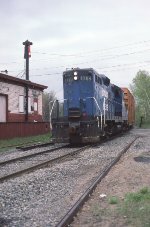 Description: B&M 1709 still wears her as delivered McGinnis-era paint scheme in 1974 at Mechanicville. She would later become ST 57. Date approximate. Description: The sun is coming up as ES-6 (East Deerfield-Salem) rumbles across Drawbridge #7 over the Mystic River. 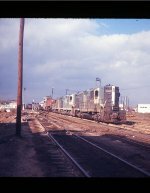 Description: Looking worn, B&M GP9 1709 lays over at Mechanicville, NY on Labor Day, 1981. Description: The two MEC U25-B's came in on POSP, but came off at E.DFLD, then went back on SPPO. Description: POME's power comes out of the pit to tie on to it's train and head west. 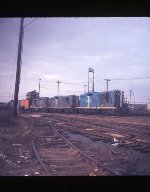 The 1709, the west end switcher, stands by. 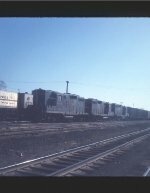 Description: An eastbound rolls into the yard from Mechanicville behind what was then standard power. Description: The famous "Railfan's Bridge", aka by the railroaders as the "dry bridge" at East Deerfiled West. Loop track to the Conn River line curves away to the right. 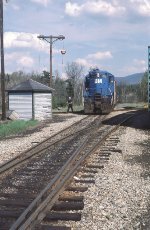 Description: The Maine Central Bucksport Turn was one of a very few trains to run on Memorial Day weekend, so I was lucky to catch it. Here it is, just getting underway at the MEC yard-now signed for Springfield Terminal, note the sign on the office at left-with a trio of interesting units. Description: The Bucksport Turn ran Sunday of Memorial Day weekend, using a classic set of New England power. Here we see it with a blue B&M geep, and a pair of Harvest Gold MEC units, arriving at Bucksport. Description: Now off the bridge from Bangor, the Turn gets moving toward Bucksport. Thats the railfan chase vehicle. It was a company car that I had on a 24/7 basis. They mostly didnt care where I took it, though I had to buy my own gas when on personal use. I lived ten miles from my job, and put 38,000 miles on it in a year. Description: The Bucksport Turn crosses the Penobscot River just after leaving the Bangor yard. Title: This is what I want in my back yard!! 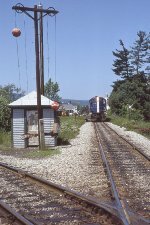 Description: The Maine Central Bucksport Job rolls past a home en route from Bangor to Bucksport on a Memorial Day weekend. 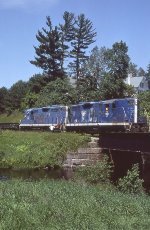 Description: The Maine Central Bucksport Job works south from Northern Maine Jct on Memorial Day weekend 1988 with a classic set of New England power. Description: The MEC Bucksport Turn went to work on Sunday of Memorial Day weekend with a typically New England power set.